I inherited my home phone number from someone else and despite going onto telephone preference (and having the number for 8 months I regularly get calls for the previous owner. Today I got home to find not a message but a text message waiting, it read "Just to tell you Pat has died"! 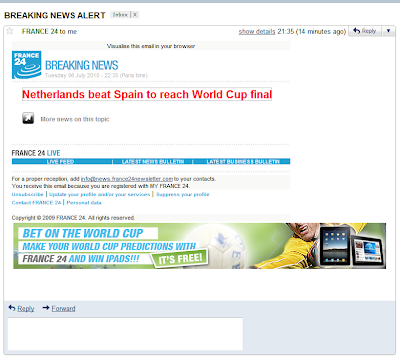 I would hate to think what sort of person decides text messages are the best way to break such bad news. I felt like calling back, but perhaps they are grieving so maybe best not. Today hasn't been the best day for me, I am in the process of re-mortgaging and I got a call to inform me that my house was not valued high enough to make the 75% loan to value (which gets the best rate). So now I need to either find another £2850 (£2000 to make up the difference and £850 fee) or take a hit on the interest rate. On a positive moment it still means my house is worth a lot more than I paid for it, just not enough more. I have seen two films recently. First one was up in the air a film about corporate downsizer Ryan Bingham [George Clooney], a man who spends his entire life commuting between companies where his only job is to tell people they are no longer required. Enjoying the Freedom of his job Ryan has no ties to the real world, spending as little time as possible in his tiny lonely apartment. A new employee at the company, and his sisters weeding threatens to change him forever. Kath and I watched the film simultaneously so we could talk about it later. I really enjoyed the journey of Ryan allowing some people into his single serving life. Last night I went to the Cinema with Martina to watch Inception. Harking back to the the age old idea idea that watching a film is like a shared dream Nolan attempts to pull the viewer deeper into a dream state. A slick film, delving deep into our ideas of reality. At the end of the 90s there were a number of films along these lines including the Matrix, Existenz Dark City and the 13th Floor. Inception adds a new twist in that Dom Cobb [Leonardo DiCaprio] is a memory thief, creating dream spaces in order to enter targets minds and steal they memories. Sort of like Johnny Mnemonic who actually joins into the memory stream. Martina made an excellent point that Nolan is a very literal director. A lot of the dialogue exists seemingly to explain to the viewer exactly what is happening. I felt that Ariadne character seems to exist as a foil to allow Cobb to explain himself. The use of the elevator where Cobb's secrets were stored in the basement was also a bit predictable. Actually I found it very hard to hear the dialogue because the pounding oppressive music. I found that the visuals were stunning, the action sequences impeccably complex and I walked out of the cinema with a head full of questions about the film. I have been slightly intimidated by this post, one thousand times I have sat tapping away on my computer thinking about life, love, the future and the past. I dont think I have ever put so much effort over such a long period into anything else. Starting with my journal on Slashdot in 2002 then moving to blogger it marks 9 years of writing. This blog charts some biggest highs, crashing back to earth, late night drunken rants. At times I have written things that have literally caused relationships to break down, and strained friendships to breaking point. You might ask why carry on with something that can cause so much pain. I suppose the answer is somewhere in between the catharsis I get from the release of putting my thoughts on paper and the ego trip of publishing something, even if it is only a blog. Next week Kath is arriving for two weeks. I cannot wait to see her again, we are going to Wales for a few days to get away from it all. I will be amazing to spend time together, its a very difficult time we spend apart. Using phone calls and skype to bridge the gap is good, but nothing like the real thing. I needed to get a webpage to focus on the first field, without knowing what the first field would be, I found this website. It neatly shows how to focus on the first field in a form using a simple piece of JQuery, awesome! Talking of Fightclub there was an interesting article in the Independent. Starting out as a rebuttal that men are a dying species Christina Patterson goes on to describe a "whole sub-species of men that nobody wants". I wonder if they would make good space monkeys? 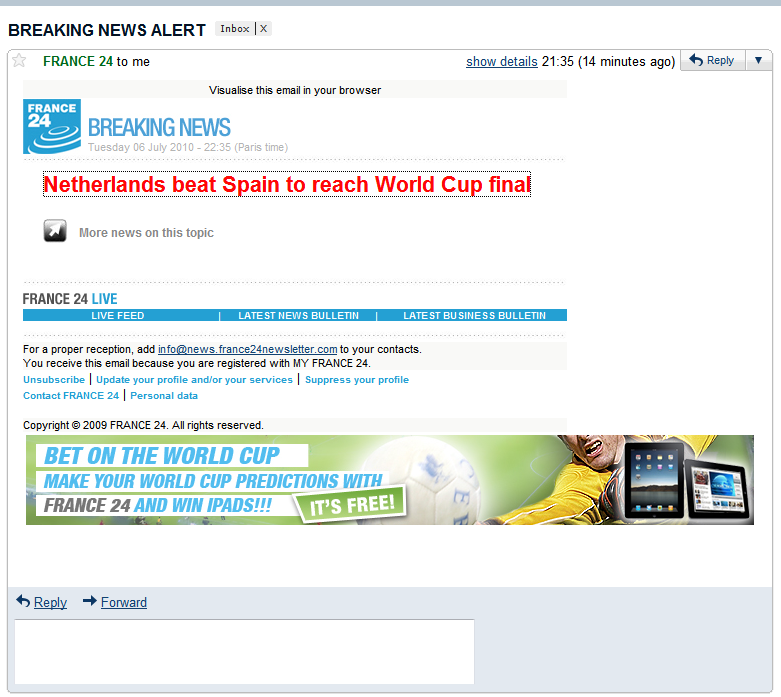 France 24 Breaking news, actually Netherlands secured a spot in the 2010 World Cup final with a 3-2 victory over Uruguay not Spain, wonder what match the reporter was watching? Yesterday morning when I arrived at work there were some guys putting up new sign-age on the an empty unit in the paddock. When I left the office to go home there was a film crew outside filming the unit. I assumed that it was for some sort of advertising. This morning however the unit is once again empty, the only signs of its use were part of a logo sill taped over one of the signs. I wonder what it was filmed for? I have been reading the novel Fight Club Having loved the film I finally thought I would get around to reading the book, only 11 years on :D In many ways I am disappointed by the book. The film basically distilled the ideas presented by the book, taking some of the best lines of dialogue and the main scenes. However the two play out in very different ways, in the book the narrator is far more involved in the various acts of Project Mayhem which I think lessen the eventual realisation the he is in fact the same person as Tyler Durden. Also of note, check out the different packaging for the versions of the film. the original DVD features both Brad Pitt and Edward Norton, though Nortan is very much in the background. Whereas the updated Blue Ray release features only Edward Norton. Last week was unusually hectic work wise so I had a little bit of a chill out over the weekend. Starting Friday night Phil came round, and we played some Call of Duty Modern Warefare 2. I was actually hopeless but we managed to get a few promotions. Saturday I got out in the garden, cut down a couple of trees and removed some of the vegetation at the back of the garden. I filled my green bin and had a boot load for the tip. Still load to do though. In the evening I headed round to Bruce's for a BBQ. After which we watched a couple of films, an older one rise of the footsoldier. It is a kind of strange film which follows the life of East end football hooligan type Carlton Leech, then becomes a who dunnit of the gangland execution of Pat Tate, Tony Tucker. After that we watched Harry Brown, another British film about crime. Michael Caine plays a retired marine who goes on a train of retribution following the death of his wife and violent murder of his only remaining friend. I found it very similar to Clint Eastwood's Grand Torino, only in the Eastwood film the conclusion is more satisfying, and I would almost say less Hollywood than Harry Brown. Sunday I went to help Jo and Holly on the allotment. A couple of hours of weeding left me feeling tired and covered in cuts from brambles. It was quite good fun though, and by the time I left you could really appreciate the difference in the vegetation. Lots less weeds around the trees. Holly suggested going for aday out while Kath is over, which hopefully we can arrange, maybe a day out in Castleton if the weather holds. I went for a swim then chatted to Kath for a for hours before bed. We are both excited that she will soon be here again. Sometimes news announcements make me feel old, I still think of .net as shiny and new, but its now been around for 10 years!